You are laying N rectangular pieces of grey-tinted glass to make a stained glass window. Each piece of glass adds an integer value "tint-factor". Where two pieces of glass overlap, the tint-factor is the sum of their tint-factors. You know the desired position for each piece of glass and these pieces of glass are placed such that the sides of each rectangle are parallel to either the x-axis or the y-axis (that is, there are no "diagonal" pieces of glass). You would like to know the total area of the finished stained glass window with a tint-factor of at least T.
the remaining marks will be for test cases where N ≤ 1000 and K ≤ 1 000 000 000. Output the total area of the finished stained glass window which has a tint-factor of at least T. All output will be less than 264, and the output for some test cases will be larger than 232. There are 4 pieces of glass used. There are two regions of glass which have a tint-factor greater than or equal to 3: one region between (13, 11) and (14, 15) (which has tint-factor of 3, except for a unit square with tint-factor 4), and another region between (17, 12) and (18, 13) (with tint-factor 3). 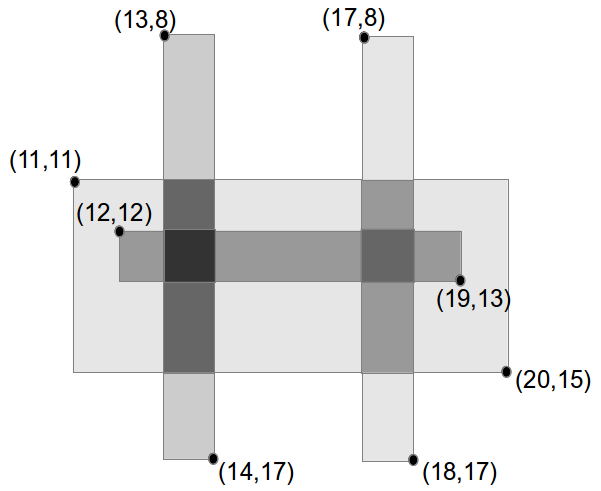 In total, these two regions have 5 square units of glass with tint-factor greater than or equal to 3, as shown on the diagram below. The coordinates are up to 10^9, so, for starters, they're too large for your array size (to say nothing of the runtime).